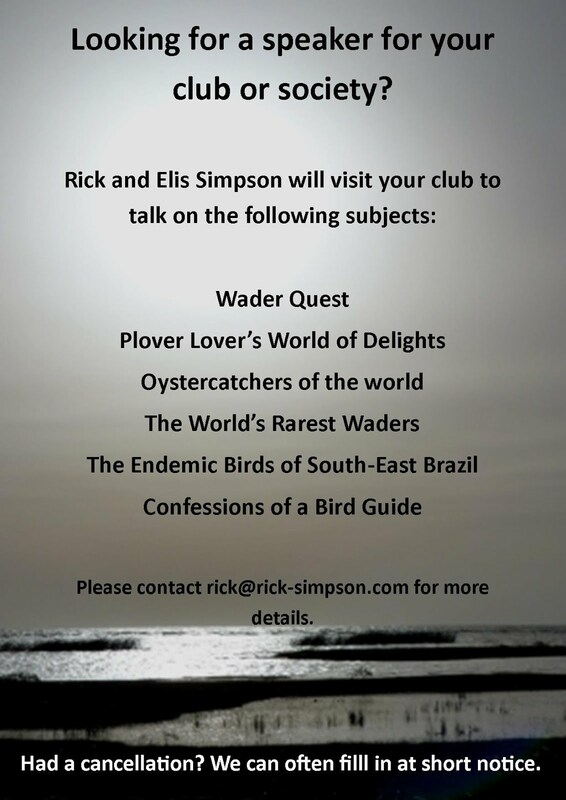 Rick Simpson Birding: Good things come to he who waits! Good things come to he who waits! In my case 24 years! In 1989 a Brünnich's Guillemot was spotted among the Common Guillemot colony on Shetland. It spent its days hopelessly casting around for a mate somewhere in the vicinity of a house brick incongruously and carelessly left on the rock face. It was there for ages leaving the rock occassionally to feed and then return. It was too much to bear and eventually I, with a crew from Hertfordshire, drove to Aberdeen, a journey of some 10 hours. We then boarded the St. Claire ferry to Lerwick for the 14hour overnight crossing. In the morning, upon arrival in Shetland, we hired a car to tour the islands in search of birds after seeing the Brünnich's. Alas it wasn't to be. 11 hours that day and 11 the next we stood on the clifftop ever more despondently watching the colony oppostite, yet the bird did not return it had clearly gone, fed up with waiting for a spouse, added to which the weather was frightful with wind and rain coming into our faces. We left the cliffs at 5 o'clock in order to catch the return ferry. When we arrived the next morning in Aberdeen some bright spark rang the birdline and it announced that the Brünnich's had returned at quarter past 5!!!!!!! A return trip was arranged for the following week, but, on the day before we were due to leave my son Martin was born 8 weeks prematurely! The rest of the crew returned to see the bird while I sat anxiously watching my boy fight for life in an incubator. Happily Martin has grown to be a strapping young man, but he was damn lucky I didn't name him Brünnich to teach him a thing or two about timing! This weekend dip was on the 24th and 25th of June 1989. A gentle drive down from Hertfordshire where we met Tony Clark and Derek Turner saw us arrive just as it was getting light. Whilst we three men discussed tactics for the day still in the car Elis jumped out and disappeared off around the corner. Two minutes later she was back and waving her arms, the bird had been seen! We were out of that car faster than you could say Uria lomvia and I pursued Elis along the harbour promenade to where the bird had been seen. When we arrived there was no sign. One person had seen the bird, it then dived and was not seen again. This seemed like a likely story to me and I guessed the guy had thought better of his identification and covered his tracks. The adrenalin rush was now followed by a bit of a low. The bird, if it was there had drowned it had been under so long. Then, some minutes later I saw a guillemot out by the sea wall, all dark headed; it dived. I alerted everyone and someone else picked it up moments later some 100m closer. I got onto it, it was the same bird; it again dived. Then it appeared about 50m from us. This time I got a good, albeit brief, look at the bird. It had an all dark head, looking good! It once again dived. This time it did not reappear and I began to think more generously towards that first sighting of the day. Some time later it was relocated outside the small harbour and every man and his dog went rushing up towards the car park. Some of us who had seen the bird were more relaxed and walked, stopping half way. Doing so proved a bonus as the bird appeared right in front of us and then again slightly into the harbour where Elis got the first photo of it and indeed the only photo of it for some time. Brunnich's Guillemot Uria lomvia; Portland Harbour, Dorset UK. The first shot of the day. The view most people got of the bird initially! As people arrived some were sceptical about the brief sightings and a series of such doubters were disatched to look at "That young lady's" photograph to settle their mind, much pleasing Elis enjoying the limelight and being referred to as 'young lady' in equal measure. Part of the admiring crowd. Elis, TC and I had now seen it, Derek had not. So began the long and agonising wait for it to reappear. I didn't take note of the time exactly, but it was not seen again until gone 10 o'clock! This time everyone got splendid views and many more photos were taken, Elis, although losing her exclusivity gained some more record shots in the dismal grey conditions. The bird finally settled down to shelter from the wind behind a boat, sadly not very close to us or Elis' camera. Back in 1989 I fancied myself as a bit of a poetic pensmith and I wrote this limerick about our weekend dip. Not seen up to six o'clock, but presumably will return. This here is a tale of woe. An epic as some stories go. What to see? I think you all know! Some time getting on for late June. To tick it and hoped it'd be soon. Beside us and give us the eye. The rain tumbled out of the sky. But none of us ever lost hope. Not daring to twitch phalarope. We went off to where we would stay. And a Bible to help you to pray! Well I never thought that it would. We'd dipped! For nothing we'd stood. We went back and got on the ship. All trying to laugh off the dip. As into the harbour we'd slip. And from it we bitterly learned. The flippin' thing went and returned!! Who twitch Shetland etc. beware! Is going to be bloomin' well there! If you wait long enough so it seems. At the end of the tunnel, hope gleams! Though wind and rain lashed. At last fulfilling our dreams! Brunnich's Guillemot finally on my list 27th December 2013. Ivory Gull in East Yorkshire.